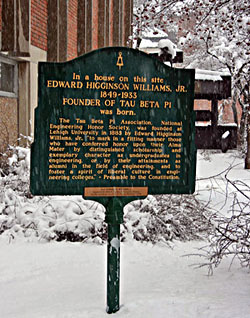 The Tau Beta Pi Association, national engineering honor society, was founded at Lehigh University in 1885 by Dr. Edward Higginson Williams, Jr., "to mark in a fitting manner those who have conferred honor upon their Alma Mater by distinguished scholarship and exemplary character as undergraduates in engineering, or by their attainments as alumni in the field of engineering, and to foster a spirit of liberal culture in engineering colleges." A member of Phi Beta Kappa, the first established honor society, he was head of the mining department of Lehigh University when he determined to offer technical men as good a chance of recognition for superior scholarship in their field as that afforded by Phi Beta Kappa in the liberal arts and sciences. Late in the spring of 1885 he invited the valedictorian of the senior class, Irving Andrew Heikes, to membership and he accepted, becoming the first student member of Tau Beta Pi. The parent chapter, named Alpha of Pennsylvania, existed alone until 1892 when Alpha of Michigan was founded at Michigan State University. Since the founding of the Michigan Alpha chapter, Tau Beta Pi has grown steadily; there are now collegiate chapters at 248 institutions, charted alumnus chapters in 59 cities, and a total initiated membership of more than 599,246.